Most of us don't think twice about taking a book off an overhead shelf, reaching an arm back to put on a coat, or rolling a bowling ball. But if you have a frozen shoulder (also called adhesive capsulitis), these simple movements can be painful and nearly impossible. Frozen shoulder is the temporary loss of normal range of motion in the shoulder. It tends to get worse, and can lead to considerable disability. The condition typically affects adults over age 40, and women more often than men. Experts don't fully understand what causes frozen shoulder. An inflammatory process is probably involved. Often a shoulder freezes up because it hasn't been used for a while because of pain, injury, surgery, or illness. In most cases, a frozen shoulder can be unfrozen, although full recovery may take months and a lot of self-help. The shoulder joint has a wider and more varied range of motion than any other joint in the body. It's made up of three bones — the clavicle (collarbone), the scapula (shoulder blade), and the humerus (upper arm bone). 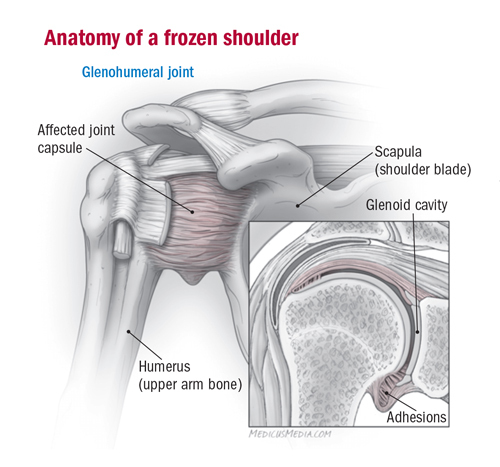 The main joint is a ball-and-socket arrangement called the glenohumeral joint, which joins the top of the upper arm bone to a scooped-out part of the shoulder blade called the glenoid cavity. The glenohumeral joint lets the shoulder move forward and backward and lets the arm rotate and extend outward from the body. A flexible capsule filled with a lubricant called synovial fluid protects the joint and helps keep it moving smoothly. The capsule is surrounded by ligaments that connect bones to bones, tendons that fasten muscles to bones, and fluid-filled sacs called bursae that cushion tendons and bones during motion. This elaborate architecture of soft tissues accounts for the shoulder's marvelous flexibility, but also makes it vulnerable to trauma and chronic wear and tear. A frozen shoulder develops in stages. The process usually begins with injury or inflammation of the soft tissues of the shoulder. With inflammation comes pain that is worse with movement, which limits the ability to use the joint in its full range of motion. When the shoulder doesn't move, the capsule surrounding the glenohumeral joint eventually thickens and contracts, losing its normal capacity to stretch. The upper arm bone has less space to move around. The joint may also lose its lubricating synovial fluid. The less the shoulder is moved to avoid pain, the more likely the capsule will contract. In advanced cases, bands of scar tissue form between the joint capsule and the head of the upper arm bone. People who don't take part in exercise therapy after an injury or tendinitis are at greatest risk of developing a frozen shoulder. Using a sling without stretching the shoulder can contribute to the condition. A period of enforced immobility as a result of a stroke, heart condition, or surgery may also result in a frozen shoulder. Sometimes the condition occurs without an obvious injury or inflammation. For example, it affects 10%–20% of people with diabetes. Other predisposing conditions include thyroid disorders, depression, and Parkinson's disease. Diagnosis begins with a physical exam to check your shoulder's range of motion. Your health care provider may ask you to have an x-ray to be sure there is no other underlying problem, such as osteoarthritis, dislocation, or a bone fragment, interfering with shoulder motion. An MRI may be needed to look for a tear in the rotator cuff — the band of muscles and tendons that stabilizes the shoulder joint. Treatment is focused on relieving pain and restoring your shoulder's normal range of motion. Your doctor may suggest that you take a nonsteroidal anti-inflammatory medication such as aspirin, ibuprofen (Advil, Motrin, generic), or naproxen (Aleve, Naprosyn, generic) to quiet inflammation and ease pain. Sometimes an injection of a corticosteroid into the shoulder joint or nearby soft tissues may be needed. But the cornerstone of treatment is physical therapy, concentrating on exercises that stretch the joint capsule (see Stretching exercises for a frozen shoulder). Muscle strengthening comes later. A physical therapist can show you how far to push yourself and teach you the appropriate exercises. Once you've learned your limitations, you can do most of the stretching routine on your own at home. While you're working to stretch the shoulder capsule, try to avoid any sports or daily activities that increase inflammation or aggravate your pain. If you diligently follow your shoulder-stretching regimen, you'll probably be able to return to your usual level of activity. Full recovery may take several months. If you don't see steady improvement or you reach a plateau, go back to your clinician or consult a shoulder expert. A small percentage of people need surgery to "unfreeze" the shoulder.